Are you looking for aggressive, high-speed cutting in dense materials such as solid wood, advanced polymer plastics, composites and non-ferrous machining. Built upon C.R. 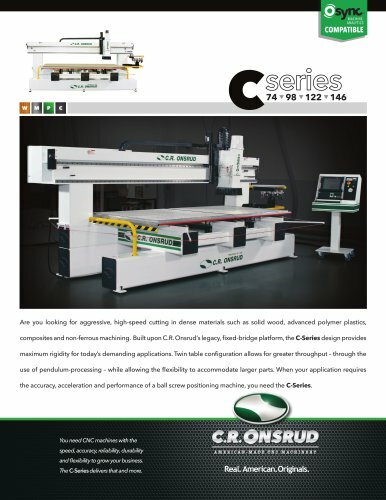 Onsrud’s legacy, fixed-bridge platform, the C-Series design provides maximum rigidity for today’s demanding applications. Twin table configuration allows for greater throughput – through the use of pendulum-processing – while allowing the flexibility to accommodate larger parts. When your application requires the accuracy, acceleration and performance of a ball screw positioning machine, you need the C-Series. You need CNC machines with the speed, accuracy, reliability, durability and flexibility to grow your business. The C-Series delivers that and more.